Submitted by Jeff Buster on Wed, 11/11/2009 - 01:35. These are the wood forms for the new Jersey Barrier - replacing the barrier removed with the old acceleration lane – on the I 90 Innerbelt bridge. 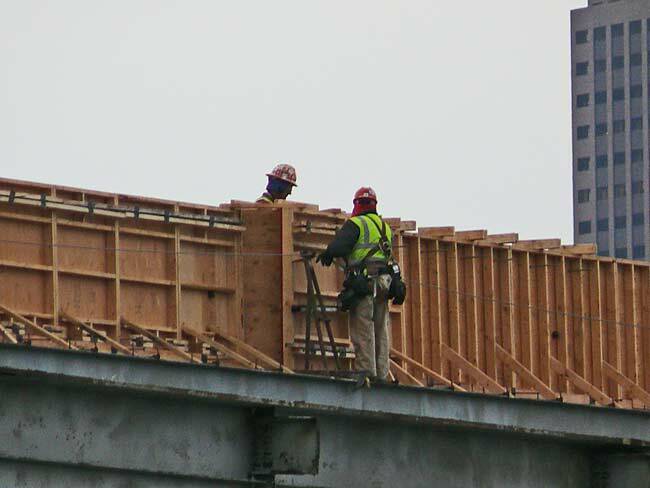 These are custom made-in-place forms, very time consuming prevailing wage activity in one of the most expensive up-in-the-air work environments. I’ll bet the former, but that’s just experienced speculation.